Once again, we are embarking on one of the noblest challenges in Jewish life – that of raising the necessary funds to continue actively building and strengthening our Jewish communities. Hundreds of dedicated volunteers and generous supporters across Northeast PA will join us this year to make a difference. Your commitment to Jewish survival and your support during our 2013 UJA Campaign will help insure a quality Jewish life here, in Israel and for Jews in 57 countries throughout the world. We want to share with you some 2011-2012 Campaign statistics that were provided to us recently from our National Federation office. There are sixty Federations our size in the U.S., and our Campaign is ranked eighth (8th) – no small achievement given our aging population and the state of our economy. In addition, our “Israel and Overseas allocation” (taken as a percentage of our gross annual Campaign) is one of the highest in the country – 32%. It’s because of our historical generosity to Jewish causes – local, regional, national and international – that we are in a position to offer such a wide variety of social, cultural, educational and recreational programs and services to our communities that simply don’t exist in any Federation our size in this country. The funds raised during our annual UJA Campaign have allowed us, for the first time in a decade, to increase our allocations to our educational, cultural, recreational and social service agencies that serve the Jewish communities of Northeast PA.
For your generosity, we are most grateful, and we hope you will continue to share your good fortune with our “family”. If we’ve achieved more than other Federations our size, it’s because we’ve always understood our responsibilities to our communities, to our People, and to Israel – none of which could have been done without our Annual UJA Campaign. Please be part of this noble enterprise and respond generously to our 2013 UJA Campaign solicitors when you are asked to do so this year. It’s not how much you contribute that matters as much as your act of giving and your recognition that you are “part of our Jewish family”. Your commitment will help write the next memorable chapter in Jewish history – a history that has always reflected the caring of one Jew for another. From the creators of The Case for Israel: Democracy’s Outpost (2009) comes a meticulous examination of rising anti-Jewish ideology. The current political assault against the State of Israel is a war against the Jewish people and their right to self-determination. 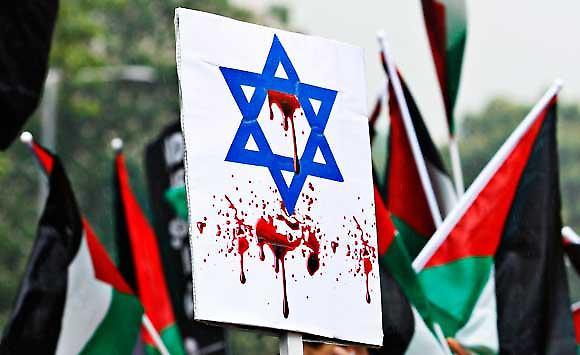 Jews are facing a threat much greater than a military threat in the battlefield or a traditional terror threat in urban centers. They are facing the possible uprooting of the very idea that there should be a nation state of the Jewish people. Filmmaker Gloria Greenfield travels from Israel to Europe to North America, covering this phenomenon from all angles, including Christian and Islamic polemics against Jews, the proliferation of anti-Israeli bias in academia and cultural institutions, misinformation campaigns and state-sanctioned denials of Israel’s right to exist. The film examines this concerted anti-Semitic campaign that is catching on in many parts of the world – among academics and intellectuals and in major American and European publications. The growing international assault by mainstream and radical groups also is an assault against democratic values, making this a matter of serious concern for free countries everywhere. Wide-ranging interviews include such eloquent and respected voices as commentator Alan Dershowitz, Senator Joe Lieberman, former U.N. ambassador John Bolton, human rights activist Natan Sharansky, British attorney Anthony Julius, Wall Street Journal columnist Bret Stephens and Israeli Deputy Prime Minister Moshe Ya’alon, among many others. UNMASKED: JUDEOPHOBIA AND THE THREAT TO CIVILIZATION is a call to action and urgent reminder that anti-Semitism is a menace not only to Jews, but to the human condition itself. 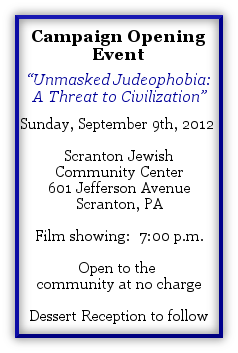 Please join us for our 2013 UJA Campaign Opening Event. 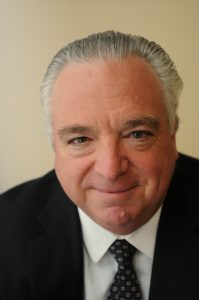 Stephen Flatow is an attorney whose 20-year-old daughter Alisa died as a result of injuries sustained during a terrorist attack in Israel in April of 1995. She was a student studying abroad. Acting under U.S. law, Flatow and his family sued the Islamic Republic of Iran as the sponsor of the terrorist attack which took Alisa’s life. In March 1998, he obtained a damage award against the Government of Iran – an award based upon Iran’s own budget allocation for funding “resistance” (terrorism) abroad. A father of five, his message is one of unity of the Jewish people, continuity and Jewish identity. Flatow has been involved in Jewish communal affairs for many years. He is a former member of the Boards of Trustees of the Nanuet Hebrew Center in Nanuet, New York; Congregation Ahawas Achim B’nai Jacob & David in West Orange, New Jersey; and the Joseph Kushner Hebrew Academy in West Caldwell, New Jersey. He is a founder and immediate past president of Congregation Ohr Torah in West Orange and a member of the board of trustees of Bat Torah Academy in Suffern, New York. Flatow and his wife were honored as “Parents of the Year” by the Parents Council of the Joseph Kushner Hebrew Academy in 1994. We would be honored if you and your family would join us. The Jewish Federation of Northeastern Pennsylvania cordially invites you to attend our tenth annual Pocono UJA Campaign Opening Event with our special guest Stephen Flatow. A gift to our 2013 UJA Campaign would be appreciated. Make the Call! Answer the Call! 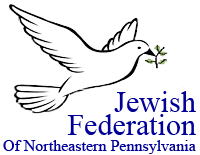 Federation is committed to securing the future of the Jewish communities of Northeastern Pennsylvania and to rescuing the imperiled, caring for the vulnerable, supporting Israel and world Jewry, and insuring a strong Jewish presence here and around the world for our posterity. This is done through advocacy, education, scholarships, subsidies, grants, allocations, planning and special programs the assist Jews of all ages and affiliations engage in Jewish life. By your gift, you help children, teens, adults, and the elderly here in Northeastern Pennsylvania and throughout the world. Do a Mitzvah! Volunteer for Super Sunday! A renown harpist, Barbara Dexter has been sharing her musical talents since the age of seven. She has entertained audiences at large social events and participated in numerous choral and musical productions. She has established an ensemble of harpists called Serenity that promotes the healing effects of music at nursing homes, schools and churches. Currently, she plays at St. Joseph’s Center (Scranton) for the severely mentally and physically challenged and has personally seen the benefits of the healing power of music on these precious souls. Prior to her work at St. Joseph’s Center, she was part of Pastoral Services at Scranton’s Community Medical Center (CMC) where she played her harp at bedsides in the ICU-CCU, Neonatal ICU, Hospice and the Behavior Unit. The Jewish Federation of Northeastern Pennsylvania is proud to have Barbara Dexter entertain our guests at our 2013 Women’s UJA Campaign event at which time she will share not only her harp music but some of her personal experiences on the healing power of its sound.